The Other Store (Snapshot! ): Did Giant Steal A&P's Classic Wood Slats? This week at P's and Q's we were introduced to an 'overwhelming variety of cheeses', I guess you could say. We saw everything, from an Italian Ice shopping at a Superfresh, to (yet another) post about the Superfresh in Doylestown... but now, we go to a different path. Today's the day I point fingers, and critique a store. And what store is this? None other than the most bland, homogeneous, ridiculously outdated supermarket-- called Giant. Right on the good 'ol Pennsylvania 412, this store is the typical Giant. Opened with the "Fun House" decor in the wee hours of the 2000's, updated recently with the new completely homogeneous (What a word!) decor for all stores-- from Giant PA to Giant MD. Like every other store that received this decor package, it was not deluxe. 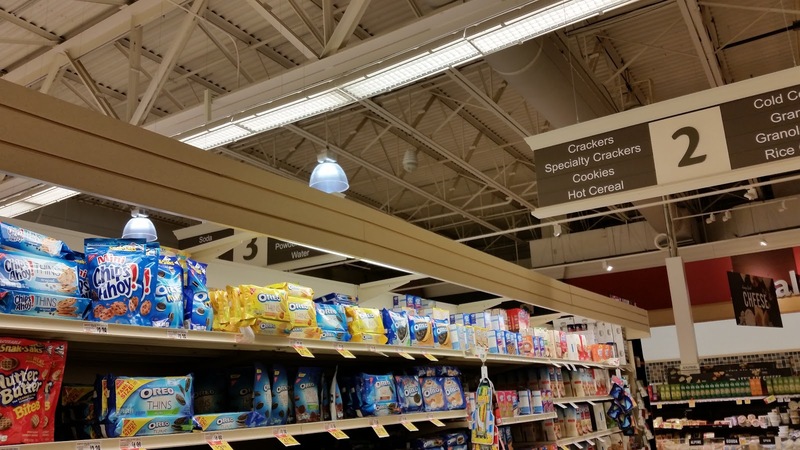 So typical aisle 2 here... crackers, granola, etc., lined with Giant's aisle toppers... Nothing suspicious one might say. But unfortunately they resemble The Great Atlantic & Pacific Tea Company's... in the same time frame. (Time to sarcastically put on my 'foil hat') Coincidence? I think not. Companies have repeatedly back-stabbed each other over a good course of time... Alpha-Beta and (That other west-coast chain whose name escapes me), Stop & Shop and A&P, and finally, Giant and Acme. These two companies have been at each other's throats for a long time... even with ads as recent as a few years ago with headlines Giant titles "BEAT ACME"... which is unrealistic. Giant is getting more expensive by the day, so I don't think their prices are anything to sneeze at. 20 years ago, maybe, but now... No, just no. The few times I've been to Giant, their pricing is definitely better than Acme. Nobody is more expensive than Acme these days. I personally don't think so. Giant tends to have a lot of things really marked up, while others really low priced. Same with Acme... it really depends on what you buy, right? I will say that it seemed Stop & Shop had better pricing than Giant, when I was a regular shopper there. I feel like in the Philly and South Jersey areas, nobody is really willing to go head to head with ShopRite. I personally think that Giant has a little bit of better pricing than S&S... at least the one I shop at. And it would make sense, because I shop regularly at the Phillipsburg S&S, and there's a ShopRite right across the highway, so that explains it! I'm not a big fan of ShopRite... too busy and they don't have good products. Kinda like Key Food. The ShopRite experience really varies from store to store. Unlike Stop & Shop, where a majority of stores have roughly the same product selection, ShopRite is so different. Certain members are great at varying their selection to the local population. Elizabeth NJ is a good example. I doubt the S&S in Elizabeth has the same ethnic selection as ShopRite. You got that right, Mike. The only reason that Stop & Shop is still in business in Elizabeth is because the prices are relatively low. Otherwise, Twin City (an excellent ethnic market practically across the street) would drive them out of business in an instant. ShopRite competes directly with Food Bazaar, and again, they can only do so on price. Food Bazaar's quality is generally better, especially in perishables, as is their ethnic selection, for the most part. But ShopRite does have a stronger ethnic selection than Stop & Shop, so they can be a stronger competitor to Food Bazaar than Stop & Shop to Twin City. They can sell an almost-as-good ethnic selection at lower prices, which is a stronger combination. Supermarket Fan, couldn't agree more! The local and independent grocers are good, they just don't have the infrastructure like the chains do.